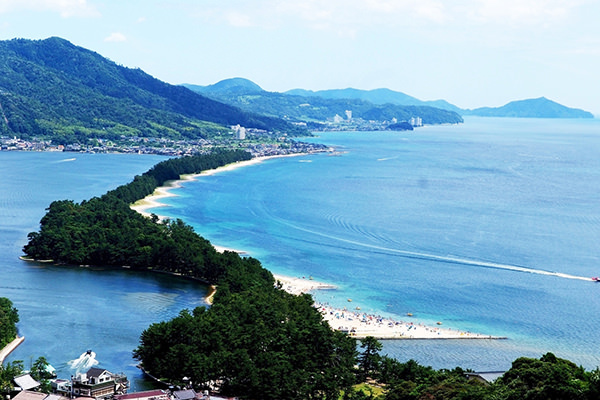 Amano-hashidate has been a very famous tourist site and regarded as one of the Three Views of Japan from ancient times. It is a sandbar in Miyazu Bay located at the north end of Kyoto Prefecture (refer to #035). In Japanese, the word "amano" is "of Heaven" or "for Heaven", and "hashidate" is "leaning a ladder". So, "Amano-hashidate" literally means "The ladder leaning against Heaven". As its name indicates, the beautiful scenery of the sandbar in the bay looks as if it were the ladder leaning against Heaven. This site has been entertaining countless tourists visiting there for at least hundreds of years to date.